Dr. Eggman seems to have truly turned over a new leaf, but Shadow does not seem to care! Can Sonic convince Shadow to give Mr. Tinker a chance before it is too late?! Sonic desperately tries to explain the situation to Shadow, but Shadow is not in the mood to listen. Rouge confirms that they all heard him say he was rebuilding Eggmanland, his deadly amusement park. Shadow does not care that Eggman has apparently lost his memory and still convinced that he is dangerous. Sonic agrees to that point, but insist that Shadow cannot lay a hand on Mr. Tinker. Shadow attempts to push Sonic out of the way to get to Eggman, but Sonic counters and pins him against a nearby wall. The two hedgehogs engage in battle, racing off at blinding speeds. Vector orders the Chaotix to help Sonic, but they immediately give up unable to match their speed. They instead turn to Rouge, blaming her for bringing Shadow to Eggman. Rouge feigns innocence and reveals that, in fact, she was the anonymous tip that the Chaotix received, and that her assistance ensured that the Chaotix found Eggman first and brought Sonic along before Shadow arrived. The two hedgehogs race around the mountain side, Sonic desperately trying to convince Shadow that Eggman is not all bad, having done some “good” things in the past. Shadow remains unconvinced. Sonic trips over a root and slams into a tree against which Shadow lands a devastating elbow into his stomach. Shadow reminds Sonic of all the times Eggman has tried to destroy him, and how he could consider leniency after all that. Sonic retorts that the same could be said for Shadow, and if Eggman could not be forgiven, how could he? This argument gives Shadow pause, before he asks what Sonic’s plan for Eggman is. Sonic says that he just will just leave him be and let him continue helping the village. Shadow suddenly realizes that Sonic had been distracting him and leading him away from the village. Without notice, Shadow speeds away back towards the village where the Chaotix prepares to intercept him. Shadow uses Chaos Control to teleport past them into the house where Mr. Tinker is hiding. Rouge is there waiting and states how stubborn Shadow is, and that he does not have to do this. Shadow informs her that he already discussed the matter with Sonic. Rouge steps aside and Shadow demands Mr. Tinker show him this, “Eggmanland”. Mr. Tinker leads Shadow across the village to a shed which he unlocks and opens to reveal a quaint amusement park he had been building for the children of the village. Having seen enough Shadow leaves, and Sonic reassures Mr. Tinker that he is in the clear. The Chaotix thank Rouge for her assistance as they also depart. Finally, Sonic asks Mr. Tinker how he came up with the name, to which he replies it was just some nonsense that he made up. Mr. Tinker urges Sonic to return to see the completed work, and Sonic assures him that he will come check up on him from time to time. Elsewhere, the unknown figure who has been watching from the shadows is revealed to be Eggman preparing to join his Egg Fleet to attack Angel Island. Since the moment I finished issue #5, I have eagerly counted the days until the next issue dropped and I could finally see what had to be an epic showdown between Sonic & Shadow. While some significant blows were exchanged, it was words that won the day for Sonic, and thanks to Flynn’s stellar writing, I believed it too. 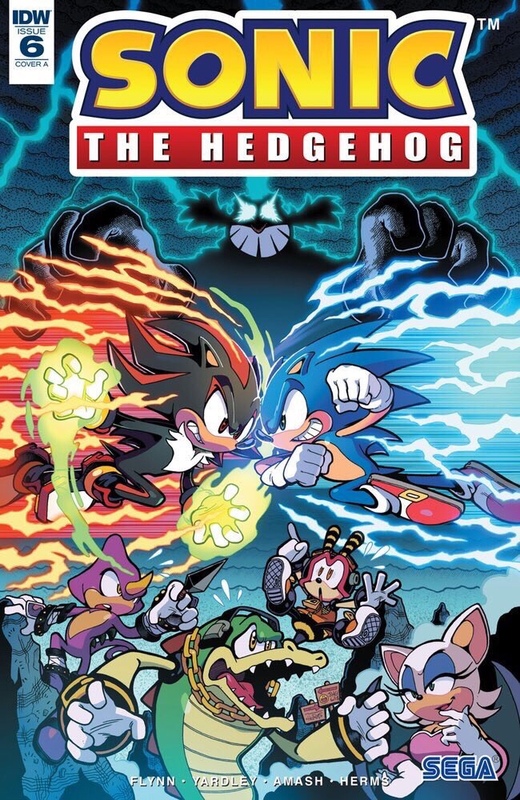 While the supporting characters did have a role to play, this issue was all about Sonic and Shadow, how they are different and how they are the same. Grim and untrusting, Shadow views Sonic as naive and short-sighted. However, ultimately both want to protect their world from the dangers of Dr. Eggman, though they have different means of doing, so. Nonetheless, although Shadow is an anti-hero, he is still a hero, and some wise and well placed words from Sonic manage to change his views by cause him to become introspective. Shadow’s argument is that Eggman is too dangerous to live, and that his past sins are too much to be forgiven even if he cannot remember them. Sonic cleverly counters him with an argument that hits Shadow harder than any punch thrown in the exchange. Shadow has also done truly terrible things, and if Eggman is not worthy of redemption and forgiveness, is Shadow? Honestly, I never expected such a deep commentary on forgiveness and redemption from a Sonic the Hedgehog comic book, but Shadow’s reaction to Sonic’s argument had some serious emotions welling up in my chest. Always, the introvert, Shadow does not give much reply to the thought, but by his actions it is clear that he had a change of heart by sparing Mr. Tinker. Flynn once again shows his commitment to making a more inclusive and complete Sonic world and canon by referencing some of the heinous things Shadow has done in past games like they did for Eggman previously. The continued integration of Sonic lore makes the world seem much richer and the smoothing out of the edges and the filling of plot holes can just be so satisfying for Sonic fans. As for the plot, ultimately, due to his creation of “Eggmanland”, complete with Badnik themed rides, we can be fairly confident that Mr. Tinker is indeed Dr. Eggman suffering from amnesia. However, this point is only complicated by the fact that the mysterious villain that has been hiding in the command chair also appears to be Dr. Eggman. While there are still several possible answers to this mystery, the signs all seem to be pointing in one direction…Metal Sonic a la Sonic Heroes. He has done it before, and it seems likely that he would do it again, however, while it seems the most likely theory, Flynn has been throwing us for a loop with some of the twists so far, so it is still anyone’s guess! Clone, robot, Eggman from another dimension? Who know!? If it is Metal Sonic or some other impostor, it is likely that he is after the true Eggman to ensure his ruse is not foiled. In issue #5 Sonic struggled with the accepting that Eggman had truly turned over a new leaf and wrestled with the horrendous past crimes he had committed. Ultimately, it was his actions that convinced Sonic that he could actually do some good and at least begin to atone for the sins he had wrought on Sonic’s world. This time around, the shoe is on the other foot. Sonic must convince Shadow not just to punish a man who does not remember his past crimes, but kill him for them as well. Sonic defends Mr. Tinker and draws him away from him as he tries to convince Shadow. While Sonic’s winning argument was potent, I liked that he did not immediately proffer it and instead had to stumble his way towards it . It felt like an organic, real argument two people might have with the entertaining addition of super speed. I really enjoyed seeing Sonic using his wits and his convictions to defeat a foe and win the argument rather than just smashing things. In just 6 issues, we have seen many sides of Sonic, and I hope to see much more! Shadow, as his name implies, has a much different take on the Mr. Tinker Dilemma. Initially, he is intent on eliminating Eggman, amnesia or not. Eggman is a threat to the safety of their world and needs to be removed, permanently. If Sonic and the Chaotix were not there first, it is almost certain that Eggman would have met this fate at the hand of Shadow. However, Sonic baits him into a fight and lures him away from the village and Mr. Tinker. During their fight/argument, Shadow unsurprisingly says very little. Sonic gives a weak argument that there were times where Eggman did seemingly good things. Shadow rebutted with that fact that his horrendous crimes far outweigh the supposed good things he has done. However, Sonic gives him pause when he reminds him of his own past sins, and how he has been forgiven. Unwilling to be a hypocrite, Shadow concedes to Sonic’s reasoning, but still needs to confirm the sincerity of Mr. Tinker himself. He rushes back to town and demands to see “Eggmanland” which turns out to be an innocuous theme park for the village children. Without so much as an acknowledgement that Sonic was right, Shadow departs. Shadow seems to accept the reasoning, but his pride forces him just to move on rather than dwell on the fact that he might have been wrong in this instance, or at least that Sonic was right. Despite not having a substantial amount of dialogue, I think this was a great introduction for Shadow into the series. Stoic, dour, and edgy with a passionately aggressive sense of justice. He clearly wants to do what needs to be done to keep the world safe, but still has enough of a heart to realize when he has gone too far. Though a side character, I really like how they utilized Rouge in this story line. Ultimately, it was her who orchestrated this whole affair and ensured it had a happy ending, even if it was in a subtle, manipulative manner. It is revealed that she was the one who tipped off the Chaotix, and thus was actually the first to discover the location and condition of Eggman. This insured that the Chaotix found him before Shadow did, and brought along Sonic as a countermeasure to Shadow. This portrays her as a master of espionage and subterfuge, moving the chess pieces in her favor. Thankfully, she is on the Resistance’s side! Furthermore, her relationship with Shadow was very interesting. While she seems to keep Shadow somewhat in check, it is more of a steering or shepherding rather than direct influence. Initially, we see her behind Shadow after making his threats, and Rouge tells them they had better make their case quickly, recognizing that Shadow will not be able to hold himself back. After the pair take off into the mountains to fight, she patiently awaits with Mr. Tinker. She acts as the final barrier between Shadow and his choice to eliminate Eggman. Curiously, she does not tell him not to do it, only that he does not have to do it. She seems to understand that she cannot directly influence Shadow, but like a force of nature, merely seek to point it in a useful direction. Thankfully, Shadow had already come to reason, and was not going to do anything rash, provided Mr. Tinker successfully explain himself. Ian has once again done a great job with the characters and making sure each has their own place to fit into the world that does not feel awkward or unnecessary. Dr. Eggman aka Mr. Tinker is an interesting case. Toward the end of this issue, the evidence that this is Mr. Tinker is Dr. Eggman with memory loss is quite strong. This in itself raises a lot of questions. If Eggman had such capacity for good in him, what exactly happened to him to make him such an evil individual? How did he arrive in Sonic’s World since at this point he is the only known human in Sonic’s world. Moreover, it seems inevitable that he will eventually regain his memory and return to his evil persona. This is evidenced by the fact that he made an amusement part with Badnik rides that he dubbed “Eggmanland”. His memories are clearly still in there somewhere waiting to return. Yet ultimate, this is all thrown for a loop by the last page’s revelation. The unknown individual that has been commanding the Eggman Empire in Eggman’s absence seems to be…Eggman?! There is clearly some shenanigans going on here, but at this point the answer seems pretty clear, especially considering some of the new covers we have seen for the next issue. Nonetheless, we will wait until the big reveal next month before we speculate any further! Again, my boys, the Chaotix did not play a very significant role this issue outside being comic relief. Vector was the one focused on, as he tries and fails to mobilize the Chaotix into action. Honestly, he and the Chaotix come out of this not looking like the most competent of detectives thanks to Rouge’s masterful manipulation of the situation. Nonetheless, their work was pivotal in guiding and informing Sonic so that he could stop Shadow from doing something he might regret. Tracy Yardley closes out the arc with some of his signature art with Inks by Jim Amash and colors by Matt Herms. Tracy had a lot of characters to play with this issue, and did a good job with portraying the range of different personalities assembled. What stood out the most for me were Shadow’s expressions during the argument, and when he flipped the table to confront Eggman, particularly. A hedgehog of few words, it is a challenge to convey the thoughts and emotions going through Shadow’s mind merely in body language, but Tracy communicated the conflict, remorse, shame, and pride quite well! Jim and Matt did excellent work, giving the book some vibrant and bold tones that reflected well on the quaint mountaintop village despite the tensions that arose there. Likewise, the awkward and embarrassing exchanges between the Chaotix and Rouge were pure gold. There were three covers for issue #7. Initially, the solicitations announced that Tracy Yardley’s would be the A cover and Jonathan Gray’s would be the B cover. This was either incorrect or was changed at some point later as tends to be the case when previews are shown months in advance. Cover A by Jonathan Gray: Jonathan Gray contributes his best cover since the Spencer’s variant, incorporating all the characters featured in the issue with a spotlight on Sonic and Shadow’s Clash. Cover B by Tracy Yardley: While I am not Yardley’s biggest fan, this cover is perhaps one of the coolest ones IDW has put out thus, far. It is definitely hard to choose a favorite between the A and B covers. The stylized stencil-like portrayal is like no other sonic cover before it! RI by Nathalie Fourdraine: Nathalie once again hits it out of the part with her unique style, illustrating her 6th RI cover in a row! I like the reversal of roles between this cover and the previous one. Retailers receive 1 copy of this cover for every 10 issues ordered. I thought this was a great way to introduce Shadow to the new book, as well as a great first appearance for Rouge. Ian and the team, continue to create solid characters that each have their own unique place in the world. This book just keeps getting better and better, and I cannot wait for the big reveal next month with Adam Bryce Thomas illustrating. The cliff hanger leaves you wondering who this faker is playing at being Eggman. We know it cannot be him, but who is it?! The stage is set, and I have a feeling that things are about to start moving fast…but that is how we like it, is it not? Thanks for reading our review of issue #6! We hope you enjoyed it! If you did keep checking back for the latest IDW Sonic news! We always have our eyes out for the latest announcements or news, no matter how small! Until next time…gotta speed!